For Concord Water Heater Service call 925-946-6619 24 hours a day and speak with a live water heater expert. Are you having a problem with a water heater or have questions about Concord water heater service Water Heaters Only, Inc has been specializing in Concord water heater service including installation, replacement & repair since 1968. If you need a simple thermostat repair or a new tankless water heater installed we offer low prices, quality workmanship and back our products and work with a guarantee. Call 925-945-6619 24 hours a day to speak with a water heater specialist and set up a time for a technician to visit your home or business and see how we can help you solve any water heater problem you may have. 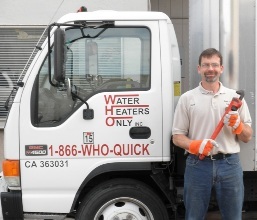 Water Heaters Only, Inc provides water heater service in Concord and the surrounding communities including: Walnut Creek, Clayton, Lafayette, Orinda, Pleasant Hill, Danville and Martinez. With over 44 years of honest reliable water heater service there is no reason to call another concord water heater service company, just one call and all your water heater troubles will be taken care of. Remember our expert water heater employees answer the phone 24 houra a day, 7 days a week, 365 days a year. Our commitment to providing low cost, high quality water heater service. Read our customer reviews and learn for your self why our customer rate us 5 stars!